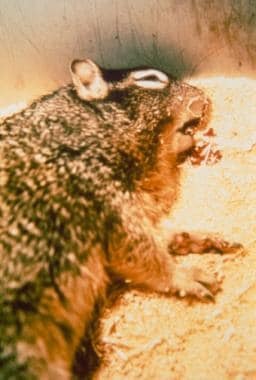 Plague, a zoonotic disease caused by the gram-negative bacterium Yersinia pestis, is transmitted to humans by the bites of infected fleas (eg, Xenopsylla cheopis), scratches from infected animals, inhalation of aerosols, or consumption of food contaminated with Y pestis. [1, 2] No disease has impacted civilization as deeply as the plague. As many as 200 million people have died from this disease. The first pandemic, known as the Justinian plague (AD 541-544), began in Egypt and spread throughout the Middle East and Mediterranean areas. Eventually, the entire known world was affected. By the 8th century, plague receded into scattered endemic areas. The second pandemic began in 1347, when traders from central Asia introduced plague into ports of Sicily. This became the first epidemic, known as the Black Death, which killed over one third of the population of Europe. Later, following the Great Plague of London (1665), the disease subsided. Examples of findings are shown in the images below. The classic mode of transmission to humans is a flea bite (see the image below). Alternately, broken skin serves as a portal when tissue or blood of an infected animal is handled (skinning or evisceration of infected animals). Competency of the flea to serve as vector for transmission of plague to humans depends on its willingness to feed on a human host and its tendency to regurgitate intestinal contents during a blood meal. Fleas from sylvatic rodents feed on humans only reluctantly. However, the Oriental rat flea (Xenopsylla cheopis) is an effective vector because of its tendency to regurgitate and to feed on nonrodent hosts (see the image below). Male Xenopsylla cheopis (oriental rat flea) engorged with blood. 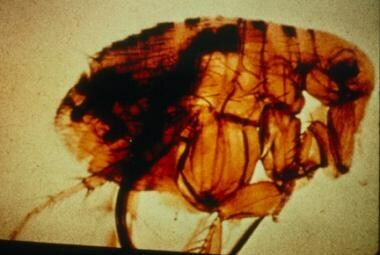 This flea is the primary vector of plague in most large plague epidemics in Asia, Africa, and South America. 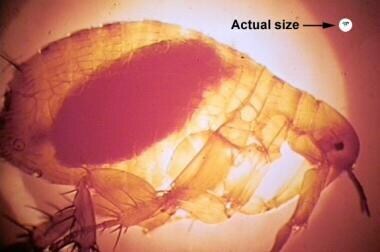 Both male and female fleas can transmit the infection. Image courtesy of the Centers for Disease Control and Prevention (CDC). When the flea takes a blood meal from an infected rodent, stomach enzymes cause a clot to form, blocking the flea's proventricularis. At its next attempt to feed, unable to swallow due to the blockage, the flea regurgitates plague bacilli into the bite wound. The organisms invade the lymphatics and travel to regional lymph nodes, causing inflammation (see the image below). Large, tender lymph nodes are termed buboes and give the bubonic form of plague its name. If the infection is not contained at this site, the organisms may be further spread via the bloodstream to organs such as lungs, spleen, liver, kidneys, and meninges. 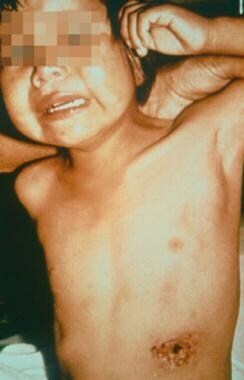 Bacteremia without the appearance of buboes is considered septicemic plague. Pneumonic plague occurs when pneumonia results from either hematogenous spread (secondary pneumonic plague) or inhalation (primary pneumonic plague) of organisms transmitted from animals or other humans. 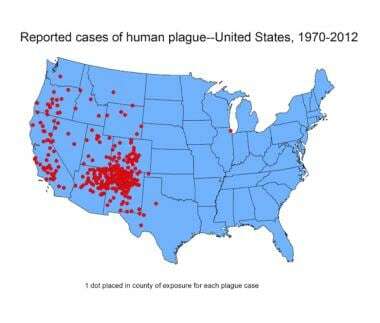 Reported cases of human plague in US 1970-2012. Courtesy of the CDC. Dogs and cats are susceptible to plague. Domestic animals, cats in particular, have been responsible for human cases. However, plague activity increased during 2015. In a CDC report published on August 25, 2015, a total of 11 cases of human plague had been reported since April 1, 2015. Affected patients were residents of six states: Arizona (two), California (one), Colorado (four), Georgia (one), New Mexico (two), and Oregon (one). The two cases in Georgia and California residents were linked to exposures at or near Yosemite National Park in the southern Sierra Nevada Mountains of California. It is unclear why the number of cases in 2015 is higher than usual. Plague reached a worldwide maximum of 5419 cases (274 fatal) in 1997, and the incidence has declined since that time. In 2003, 9 countries reported 2118 cases (182 fatal) to the World Health Organization (WHO). Algeria reported cases of human plague for the first time in 50 years. India and Indonesia also recently reported cases after a 30-year to 50-year quiescent period. Almost all of the cases reported in the last 20 years have occurred among people living in small towns and villages or agricultural areas rather than in larger towns and cities. Between 1,000 and 2,000 cases each year are reported to the World Health Organization (WHO), though the true number is likely much higher. Occurrence is thought to be underreported. [12, 13] Currently, about 95% of the world’s human plague cases now occur in the African region, including Madagascar. 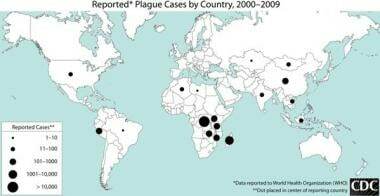 World distribution of plague is shown below. Worldwide distribution of plague cases 2000-2009. Courtesy of the CDC. Mortality is approximately 16%, which increases to 40-70% in untreated cases. Practitioners must maintain a high index of suspicion for plague, especially with patients exposed to animals or fleas in endemic areas. The most common complications are secondary septicemia, pneumonia, and meningitis. Polyarthritis, lung abscesses, and superinfection of lymph nodes also rarely occur. Mortality ranges from 30-50% for patients with septicemic plague and increases to nearly 100% in untreated cases. This high mortality rate reflects the difficulty in diagnosis, given the disease's similarity to gram-negative bacterial sepsis. Diagnosis is often made postmortem. The fatality rate of untreated pneumonic plague approaches 100%. 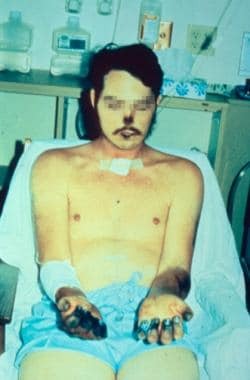 The last reported case of person-to-person transmission occurred during a plague epidemic in Los Angeles in 1924. Since then, cases of primary pneumonic plague have been acquired chiefly from infected cats. 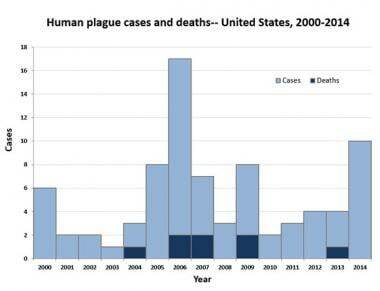 Human plague cases and deaths in US 2004-2014. Courtesy of the CDC. Plague occurs in both men and women. It is slightly more common among men. Plague has occurred in people of all ages, although, 50% of cases occur in people ages 12–45. Butler T. Plague into the 21st century. Clin Infect Dis. 2009 Sep 1. 49(5):736-42. [Medline]. Williamson ED. Plague. Vaccine. 2009 Nov 5. 27 Suppl 4:D56-60. [Medline]. Rocca P. The modern plague. Del Med J. 2007 May. 79(5):189-90. [Medline]. Ben Ari T, Gershunov A, Gage KL, et al. Human plague in the USA: the importance of regional and local climate. Biol Lett. 2008 Dec 23. 4(6):737-40. [Medline]. [Full Text]. Thiagarajan B, Bai Y, Gage KL, Cully JF Jr. Prevalence of Yersinia pestis in rodents and fleas associated with black-tailed prairie dogs (Cynomys ludovicianus) at Thunder Basin National Grassland, Wyoming. J Wildl Dis. 2008 Jul. 44(3):731-6. [Medline]. Adams DA, Jajosky RA, Ajani U, Kriseman J, Sharp P, Onwen DH, et al. Summary of notifiable diseases--United States, 2012. MMWR Morb Mortal Wkly Rep. 2014 Sep 19. 61 (53):1-121. [Medline]. Kwit N, Nelson C, Kugeler K, Petersen J, Plante L, Yaglom H, et al. Human Plague - United States, 2015. MMWR Morb Mortal Wkly Rep. 2015 Aug 28. 64 (33):918-9. [Medline]. Cleri DJ, Vernaleo JR, Lombardi LJ, et al. 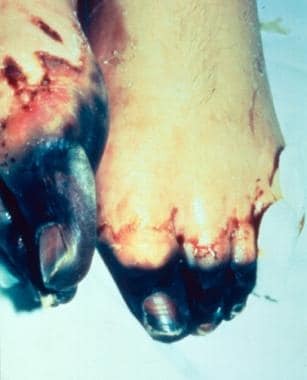 Plague pneumonia disease caused by Yersinia pestis. Semin Respir Infect. 1997 Mar. 12(1):12-23. [Medline]. World Health Organization. Human plague in 2002 and 2003. Wkly Epidemiol Rec. 2004 Aug 13. 79(33):301-6. [Medline]. Gupta ML, Sharma A. Pneumonic plague, northern India, 2002. Emerg Infect Dis. 2007 Apr. 13(4):664-6. [Medline]. Neerinckx S, Bertherat E, Leirs H. Human plague occurrences in Africa: an overview from 1877 to 2008. Trans R Soc Trop Med Hyg. 2010 Feb. 104(2):97-103. [Medline]. Human plague: review of regional morbidity and mortality, 2004-2009. Wkly Epidemiol Rec. 2009 Feb 5. 85(6):40-5. [Medline]. Piarroux R, Abedi AA, Shako JC, Kebela B, Karhemere S, Diatta G, et al. Plague epidemics and lice, Democratic Republic of the Congo. Emerg Infect Dis. 2013 Mar. 19(3):505-6. [Medline]. [Full Text]. Runfola JK, House J, Miller L, Colton L, Hite D, Hawley A, et al. Outbreak of Human Pneumonic Plague with Dog-to-Human and Possible Human-to-Human Transmission--Colorado, June-July 2014. MMWR Morb Mortal Wkly Rep. 2015 May 1. 64 (16):429-34. [Medline]. Mittal V, Bhattacharya D, Rana UV, Rai A, Pasha ST, Kumar A, et al. Prompt laboratory diagnosis in timely containment of a plague outbreak in India. J Commun Dis. 2006 Dec. 38(4):317-24. [Medline]. Russell P, Nelson M, Whittington D, et al. Laboratory diagnosis of plague. Br J Biomed Sci. 1997 Dec. 54(4):231-6. [Medline]. Tomaso H, Jacob D, Eickhoff M, et al. Preliminary validation of real-time PCR assays for the identification of Yersinia pestis. Clin Chem Lab Med. 2008. 46(9):1239-44. [Medline]. Plague: Resources for Clinicians. Centers for Disease Control and Prevention. Available at http://www.cdc.gov/plague/healthcare/clinicians.html. October 5, 2015; Accessed: March 30, 2016. Stevens DL, Bisno AL, Chambers HF, Dellinger EP, Goldstein EJ, Gorbach SL, et al. Practice guidelines for the diagnosis and management of skin and soft tissue infections: 2014 update by the Infectious Diseases Society of America. Clin Infect Dis. 2014 Jul 15. 59 (2):e10-52. [Medline]. Weir E. Plague: a continuing threat. CMAJ. 2005 Jun 7. 172(12):1555. [Medline]. Wang X, Zhang X, Zhou D, Yang R. Live-attenuated Yersinia pestis vaccines. Expert Rev Vaccines. 2013 Jun. 12(6):677-86. [Medline]. Dennis DT, Chow CC. Plague. Pediatr Infect Dis J. 2004 Jan. 23(1):69-71. [Medline]. Ligon BL. Plague: a review of its history and potential as a biological weapon. Semin Pediatr Infect Dis. 2006 Jul. 17(3):161-70. [Medline]. Dattwyler RJ. Community-acquired pneumonia in the age of bio-terrorism. Allergy Asthma Proc. 2005 May-Jun. 26(3):191-4. [Medline]. Wright stain peripheral blood smear of patient with septicemic plague demonstrating bipolar, safety pin staining of Yersinia pestis. Although Wright stain often demonstrates this characteristic appearance, Giemsa and Wayson stains most consistently highlight this pattern. Courtesy of Jack Poland, PhD, Centers for Disease Control and Prevention (CDC), Fort Collins, CO.
Inguinal bubo on upper thigh of a person with bubonic plague. Image courtesy of the Centers for Disease Control and Prevention (CDC). Yersinia pestis bacteria on fluorescent antibody test. Image courtesy of the Centers for Disease Control and Prevention (CDC).